It wasn’t “shag” carpet. But it was shaggier than most of the carpet you see nowadays. Inch-long carpet fibers, ranging in color from dark brown to very dark brown. It had rivers of shorter fibers running throughout, corralling the taller bits into irregular shapes and landmasses. Staring down at it, you could see a vast collection of shaggy plateaus, cut through by ravines and slender canyons, spanning my entire bedroom floor. And it could be scary. 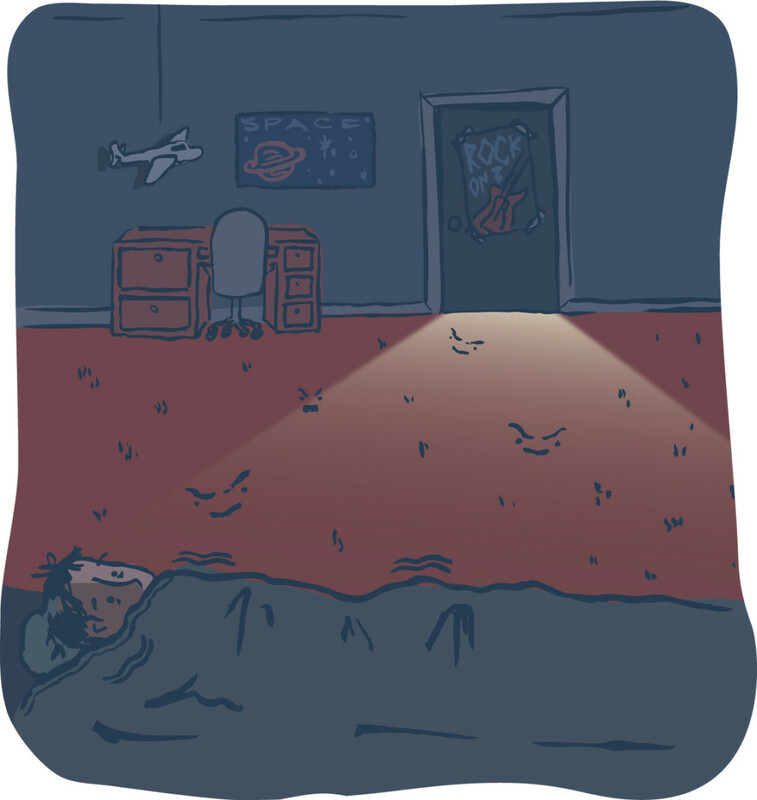 I slept with a light on for most of my childhood, all the way through grade school. And, um, high school. In our house on the west side of Eau Claire, my mom would leave the bathroom light on down the hall, cracking open the door, so its dim glow would flood into my room and across the carpet. It’s a frustrating kind of fear when you’re too young to calm yourself down, but too old to go shuffling up to your parents’ bedside and share your dark worries. That’s what babies do. And I wasn’t a baby. On so many nights, I had trouble sleeping. I’d lay there, pulling the worst, spooky things I could imagine from the murkiest corners of the room. There in the fuzzy shadows while everyone else dozed, I’d be afraid the way kids are afraid. It’s a frustrating kind of fear when you’re too young to calm yourself down, but too old to go shuffling up to your parents’ bedside and share your dark worries. That’s what babies do. And I wasn’t a baby. So I’d turn onto my side, pull the covers up to my ear, and push my face into the least black part of the room. I’d look at the carpet. And I’d see faces. I remember seeing a show on TV about how we naturally see familiar things in random shapes and textures. That’s why a mountain on Mars looks like a human face, some kind of ancient alien monument. That’s why we like to call a planetary nebula floating in space 700 light-years away the “Eye of God,” instead of its considerably more boring name, NGC 7293. That’s why the faucet in the wall perched over your bathtub looks like a goofy, metallic Gonzo. Our brain strives to recognize a pattern and to put things into categories, because that’s how we make sense of the world. It’s how we survive. Try telling that to some restless kid staring at his floor in the middle of the night. I knew if I stared long enough, I’d see the faces. When the first one appeared each night, I’d hear a quiet rush in my ears, and I couldn’t move. It was always grotesque and misshapen, but not always mean-looking. Sometimes, the faces were sad. They could be happy, too. But mostly, they looked like little goblins with wicked smiles. The faces were small, rarely bigger than my fist, but they moved. Or they seemed to. I’d fix my gaze onto them, and the longer I stared, the more they’d morph and flicker. I’d let my eyeballs tense up and dry out, waiting to see what the faces would become, but they never stopped shifting around. I’d blink, and they’d be back to normal. Well, as normal as an apple-sized nighttime goblin face staring back at you from within your floor can be. I knew they weren’t real faces, not the kind that could talk to me, or scream at me, or bite. If I dared to get out of bed, to walk on them, they lost their shape altogether. From a fresh angle, they were nothing. But they were something. I never saw them during the day. This went on for years, so eventually I learned to ignore them. What else could I do? I was never a flashlight-n-book under the sheets kind of kid, so I just laid there, waiting for sleep. But sometimes, when I was bored, I’d actually try to find them. I’d decide a certain patch of carpet was a mouth, and these little bits were the eyes, and that spot there could be the nose. It never worked. So I’d just clear my mind and start dragging my gaze across the floor, within that same shaft of dingy light creeping in from the bathroom down the hall. And they would come. On their own. I never really had to find them. Always, they found me.